The Podcaster offers an end-address configuration. The Podcaster opens up possibilities for anyone who records audio-from podcasters, journalists and students to business people adding audio files to multimedia presentations. It comes with unparalleled A/D converters, so the microphone can be plugged into any computer with no in/out boxes, just a USB cable. 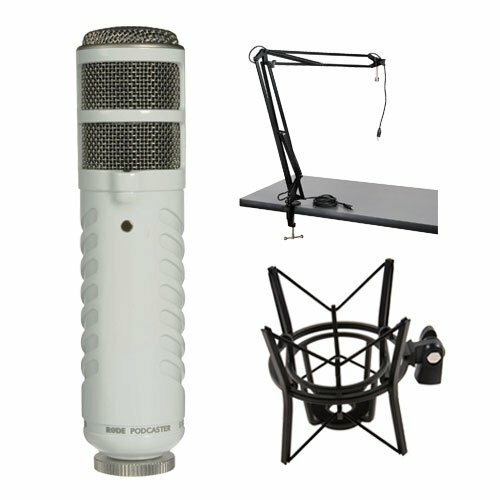 In addition, the Rode PSM1 Shockmount is designed for the Rode Podcaster. The shockmount provides adequate protection against noise caused by movement, vibration, noise, etc. While, The Auray BA-2EU Two-Section Broadcast Arm with Integrated USB Cable is designed to help keep your workspace clean, eliminating the clutter of microphone stands and cables.Its flexible two section balanced spring design allows for quick and easy positioning and re-positioning of the arm and microphone around your desk.